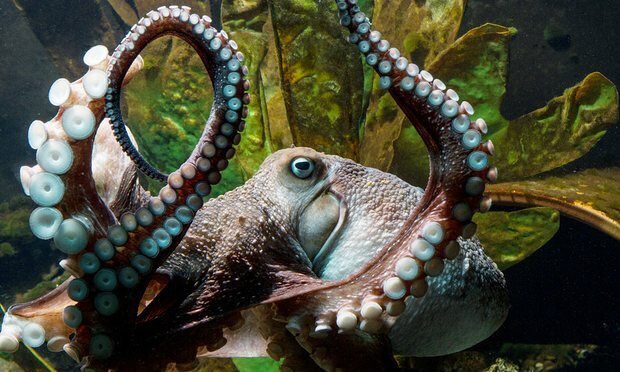 An octopus has escaped from the national aquarium in New Zealand by breaking out of its tank, slithering down a 50-metre drainpipe and into the sea. Inky (pictured left) – a common New Zealand octopus – made his dash for freedom in the middle of the night after the lid of his tank was accidentally left slightly ajar. One theory is that Inky slid across the aquarium floor – a journey of three or four metres – and then, sensing freedom was close, slipped into the 50m drainpipe that lead directly to the sea on the east coast of New Zealand’s North Island. Another possible escape route could have involved Inky squeezing into an open pipe at the top of his tank, which led under the floor to the drain. Inky was brought to the national aquarium a number of years ago by a local fisherman who found him caught in a crayfish pot. He was in a bad way - scarred and ‘rough looking’, with shortened limbs. Although the aquarium is not actively searching for a replacement for Inky, if a fisherman brought in another octopus it might be willing to take it on. Octopuses are known for being escape artists. Because they have no bones they are able to fit into extremely small spaces and have been filmed squeezing through gaps the size of coins. They are also understood to be extremely intelligent and capable of using tools. At the Island Bay marine education centre in Wellington, an octopus was found to be in the habit of visiting another tank overnight to steal crabs, then returning to its own.